Very proud to announce that BAD THINGS HAPPEN has won the 2017 ReLit award for Short Fiction! It comes with a ring that will let me spell out various 4-letter words. If you can think of any for me to try out, write them in the comments below. Alexander and I are very pleased to unveil the cover of the sequel to THE CASE OF THE MISSING MEN, a story called THE CURSED HERMIT, coming in fall 2019! Please tell all your friends about it! My illustrator Alexander Forbes and I are very excited to have received our first copies of The Case of The Missing Men, a 300 page graphic novel published by Conundrum Press. The book is available in select stores and will be available nationwide and across North America in November 2017! We are so pleased with how well it turned out, and with early press, such as this one from Corey Redekop from Atlantic Books Today. We also made it onto CBC's list of "Graphic Novels We Can't Wait For". This book represents years and years of hard work and dedication from my partner Alexander Forbes, and it's truly breathtaking to see the result. Making and publishing this series has been a dream of ours for nearly a decade, and we are especially excited to announce that our publisher let us put this neat little symbol on the spine. The number one. This means that yes, there is more to come. Look back for tour dates in Halifax, Montreal, Toronto, Brooklyn, and elsewhere! Thank you all so much for your kind messages. I am very proud to announce that the graphic novel I (and my longtime friend and artist Alex Forbes) have been working on for years and years finally has a home! THE CASE OF THE MISSING MEN is going to be published in Fall 2017 by CONUNDRUM PRESS. This represents our first foray into the world of comic books and graphic novels, and the culmination of a dream--to write and draw stories together--some 25 years old. 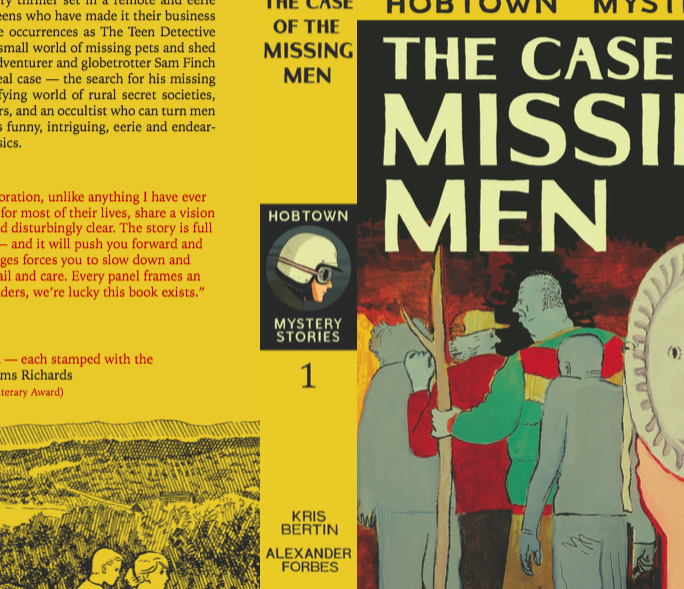 The Case of the Missing Men is the first part of an ongoing mystery thriller set in a strange and remote east-coast village called Hobtown. The story follows a gang of young teens who have made it their business to investigate each and every one of their town’s bizarre occurrences as The Teen Detective Club (a registered afterschool program). Their small world of missing pets and shed-fires is turned upside down when real-life kid adventurer and globetrotter Sam Finch comes to town and enlists them in their first real case—the search for his missing father. In doing so, he and the teens stumble upon a terrifying world of rural secret societies, weird-but-true folk mythology, subterranean lairs, and an occultist who can turn men into dogs. Alex's artwork for this project is truly breathtaking, drawing inspiration from old Stratemeyer Syndicate illustrations (such as Nancy Drew, Hardy Boys and others) and combining it with unique style, careful line work, and expressive, articulated characters. I'm continually impressed by his ability to take my script and show me things inside of it that I didn't even know were there. I'm happy to announce that my book is being launched at BEARLY'S HOUSE OF BLUES on February 29th at 7PM! Roger Howse will play some music, Alexander MacLeod will say some nice things and Oland draught will be $4! I hope you can make it! Details are still being finalized for more readings, so check back to stay in the know! Brash (in the best possible sense), intriguing, and consummate without being showy, these are terrific stories in a strong, diverse, and fascinating collection.